Everyone can unanimously agree slots are the most sought-after type of game in both online and landbased casinos, luring hundreds of players with the promise of quick and easy profits. There is a shocking diversity in terms of themes and betting limits, so there is a little something to suit each slot fan’s preferences and bankroll size. What further adds to slots’ popularity is that no particular set of skills is required to win as everything is pretty much based on luck, which practically means everyone can spin the reels. But how, when and where did the first ever slot machine come into existence? Read on to find out. You would be surprised to learn slot machines date back to the end of the 19th century, but have greatly evolved throughout the years. San Francisco mechanic Charles Fey is considered the creator of the prototype of the first ever slot machine, which came into existence as early as 1895. He called it the Liberty Bell. Needless to say, the number of paylines on the Liberty Bell was restricted to one. The highest payout was collected by the player who succeeded in lining up three bell symbols across the middle of the reels. Fey’s creation consisted of three reels and utilized symbols like card suits such as diamonds, spades, and hearts as well as horseshoes and bells. The Liberty Bell became an overnight success, largely due to the fact it was the first ever gambling device of its kind to offer automatic payouts. Soon after, slot machines were outlawed on the territory of California which prevented Fey from obtaining a patent, but the demand for his creation did not seize. Quite the contrary – various copycats attempted to reproduce the Liberty Bell, though with less success. In 1907, Fey teamed up with Chicago manufacturer Herbert Mills to give his Liberty Bell an upgrade. The result was what they called the Operator Bell, which worked on the same principle but employed new reel symbols. Instead of Fey’s card suits, the reels featured the now-classic fruit symbols, including lemons, cherries, and plums. Slot machines gained even further popularity which lead to the introduction of the Silent Bell in the 1930s. This one was considered revolutionary for its time, first of all because it featured a doubled jackpot and second, because it did not create that much noise. As the popularity of slot machines grew even further, more and more improvements were made in the decades to follow the introduction of the Silent Bell. 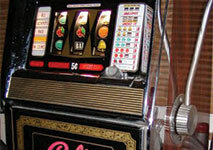 The “21” slot machine became the first all-electronic gambling device in history. This was followed by the Money Honey machine that was introduced to the public by developer Bally Technologies. These slot machines consisted of both mechanical and electrical components, which greatly improved gameplay and enabled players to make multi-coin bets. This, by itself, resulted in even higher payouts for the winners. As electro-mechanical slots gradually replaced their mechanical predecessors, the lever that players used to pull to set the reels in motion was dropped altogether. 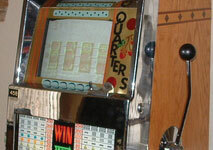 Over time, more “cosmetic” improvements were made which translated in slot machines attracting an even greater number of players. For instance, many slots featured flashing lights and exciting sounds whenever the reels were set in motion or a payout was awarded. Further improvements to slot machines were made in the 1970s after the first microchip technology exploded on the market. The advent in technologies soon brought about the emergence of the first ever video slot in history. It was at that time that Walt Fraley introduced the Fortune Coin slot machine, which was truly ahead of its time and was unlike anything slot fans had ever seen before. It was one of the first video slots to utilize a Random Number Generator to ensure the outcome of each spin was based on a completely random and fair principle. There was one single issue with video slots the likes of the Fortune Coin. Players had already grown accustomed to seeing the reels spin on mechanical or electromechanical slots, so it was difficult for them to process how the virtual display on video slots actually worked. Because of this, many slot fans actually preferred the less advanced electromechanical slots over the more visually appealing, yet complex video slots. However, fixing this issue was definitely worth investing money and time. The company which produced the Fortune Coin video slot was bought by William Redd in 1978. Redd, who at the time owned and managed International Gaming Technology (nowadays better known simply as IGT), recognized the enormous potential video slots like the Fortune Coin carried and was bent on fixing the above-listed issues slot fans were faced with. Further improvements were made to the video slot, with IGT introducing machines which featured multiple paylines in the 1980s. Yet, the multiple paylines were not the only improvement made to the video slot machines. How the players paid for a spin of the reels was also changed as putting coins into the coin slits gradually gave way to the so-called “ticket-in, ticket-out” technology. And guess what? Slot fans again have IGT to thank for this huge improvement. The ticket-in, ticket-out machines are used to print a small slip of paper, containing a unique barcode. The ticket can then either be exchanged for cash at the casino’s cashier, or it can be inserted into the video slot machine to play with. Once the player has finished playing that particular machine, they receive their ticket-out, which again contains a barcode showing the amount of money won. This allowed for greater flexibility as slot fans were no longer required to carry their coins around each time they needed to take a break, grab something for lunch or visit the restroom, for instance. Casino personnel also benefited from the new technology because they no longer needed to manually handle that much cash. As multiple paylines were equal to a greater number of winning opportunities, the new and improved video slots took off, attracting hundreds, even thousands, of slot fans to the casino floors. It was in the late 1990s when the first online casinos emerged on the scene. Needless to say, some of the first games to make it on the online casinos’ catalogs were slots, which is understandable considering the huge popularity they have been enjoying among gambling enthusiasts up to this point. There is something to fit the needs, preferences and bankrolls of all types of players as the diversity of themes, betting limits and features is beyond mind-boggling. Speaking of features, the state-of-the-art slots, developed by key software suppliers the likes of NetEnt, Microgaming, IGT, Playtech, and BetSoft, carry a tremendous winning potential. There are lucrative special features such as wild and scatter symbols, rounds of bonus spins, and mini games that further boost players’ chances of collecting a huge payout. As far as paylines are concerned, there are online slots where the number of lines players can bet on exceeds one hundred. Some online slot titles also provide players with “243 Ways to Win” on a single spin. Others offer as many as 1024 Ways to win. Then again, there are the “million makers” like Mega Moolah, providing slot fans with the opportunity to collect a seven-figure progressive jackpot without leaving their homes. The quality of the animations, graphics and sounds is superb, to say the least, not to mention the interface of the online slot variations is exceptionally user-friendly, which renders them suitable for both new and experienced players. In addition, fans can spin the reels on the go as most online casinos are either mobile-responsive or offer downloadable applications for smartphones and tablets. Gone are the days when slot fans’ pockets were clinking with coins – payments to and from online casinos are processed safely, conveniently and above-all, quickly. And to think this is only the beginning as surely further improvements and more cutting-edge innovations await slot fans in the years to follow.